RESERVOIR is a series of artworks exploring the impact of the drought on rural Australia. Waterways are diminishing and native habitats are slowly being destroyed. An air of panic enters our human conscience. This anxiety is contagious. As climate change is securing its grip on agriculture, farmers are watching their stock go hungry and their crops turn to dust. Parts of our Government risk food production in favour of mining companies extracting gas or groundwater. Major water sources are being reaped and mis-managed such as the Murray-Darling system. Lakes are contaminated. Fish, birds, and indigenous plant species are disappearing. Whole communities suffer, people suffer. The big dry does not discriminate. Yet, with anxiety and fear, comes resilience. An undeniable strength in character. This source of optimism is explored through RESERVOIR. Harsh environments are portrayed through white-bleached felt landscapes and billabongs coagulating into dark-mud hearts. The starkness is contrasted with a powerful sense of nurturing. Organic three-dimensional elements protrude from large tapestries and enclose the viewer in a soft embrace. Small sculptures suggest growth as felt limbs emerge from the dust. This series of works is as much about the drought, as it is about questioning our human condition. During the months of May, June and July, Jess will be displayed as the 'Feature Artist' at a new creative collective space - Creators Nest. Located in a beautiful period hall overlooking the main street, the Creators Nest is a retail, workshop and co-working space designed to incubate creative passions of local entrepreneurs. Pop in and see this unique space and artwork. An exhibition of unique felt artwork, objects + sculptures inspired by native bushland, local landmarks + waterways. See the Corner Store Gallery website www.cornerstoregallery.com or use the contact page for a full catalogue of artworks available for purchase. 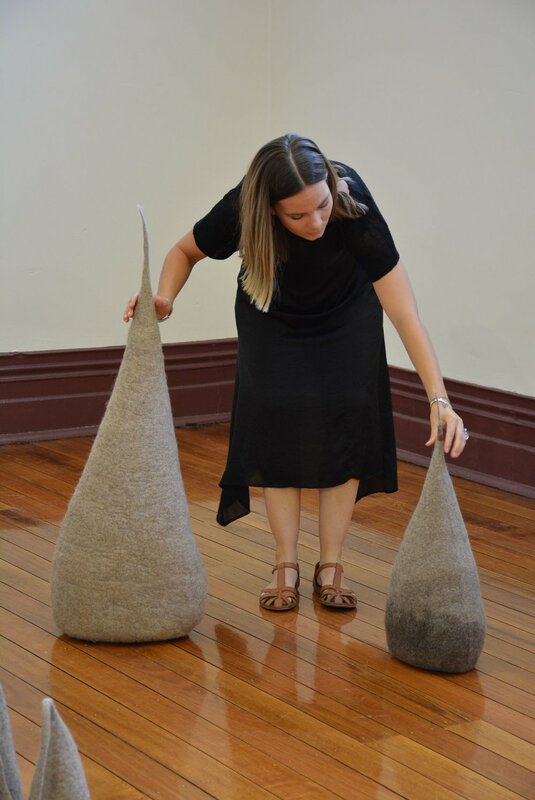 Jess Forster's solo show 'Nesting' opened on Friday 23rd February at Tumbarumba Artists on Parade Gallery. 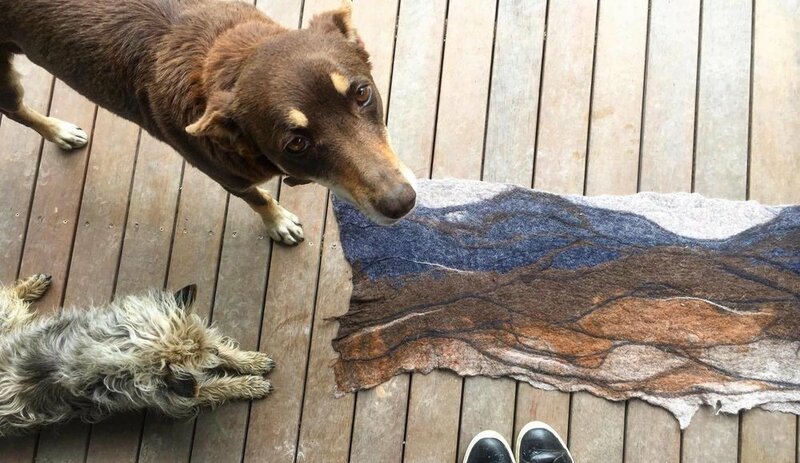 The collection of felt artworks, sculptures and objects are an exploration of local waterways, topography and bushland. 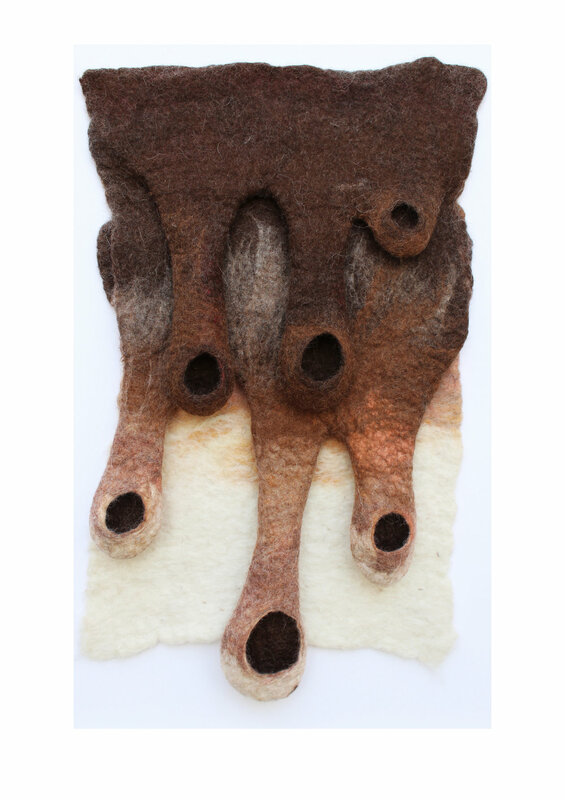 Each sculptural element is hand felted, singular construction of felt - made with local raw and hand-dyed wool.The show is on from 23rd February to 18th March. For further information on the exhibition, please contact Jess via contact form. For information about artwork prices and availability please contact the Gallery - Tumbarumba Artists on Parade on (02) 6948 3600. Land. Home. Country. is Griffith Regional Art Gallery’s community art exhibition and arts and crafts forum for 2017. It is on from 19th October - 19th November. The exhibition is grounded in the notion that an understanding of place and the environments an individual inhabits are essential parts of the creative practices of artists and crafts people. Artworks imbued with an understanding of place can convey meaning other creative mediums cannot and can provide the viewer with a transcendent experience. I was absolutely honoured to be a part of Land. Home. Country. in a place that was once my home. I was also so very grateful for friends for visiting the exhibition. The pod-like installation is called 'Parasites' and explores the notion that our relationship with our land, our planet is not symbiotic, but parasitic. Each pod, ranging from 15cm to 100cm, is hand felted locally sourced merino, cross bred and corriedale wool. The use of wool itself, explores the idea of an 'introduced' species and its impact on the environment. They are seemingly organic, natural objects - yet have the unearthly presence of alien dogma. 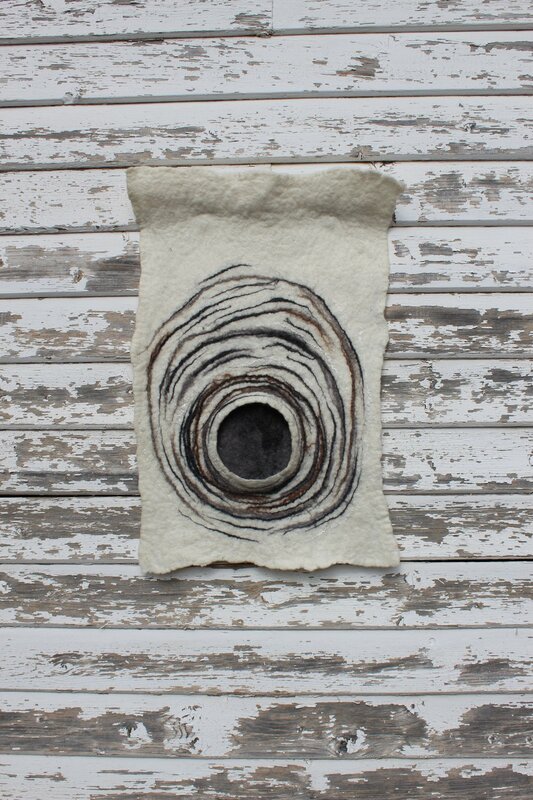 The second artwork in the exhibition is 'The Hills' - a wall-hanging landscape with layers of horizontal wool. It is both a tactile and visual exploration of the local environment. I am constantly inspired when I drive along the Hume Highway. The different layers of wool are like the undulations of the hills as I drive along, in the direction of home and red dust. Small Holdings is a fibre art exhibition hosted and curated by Timeless Textiles Gallery, Newcastle, New South Wales. With a curated collection of pieces from Local, National and International artists, the exhibition conceptually explores the idea of vessels. Jess had two pieces included in the exhibition by curator, Anne Kempton. 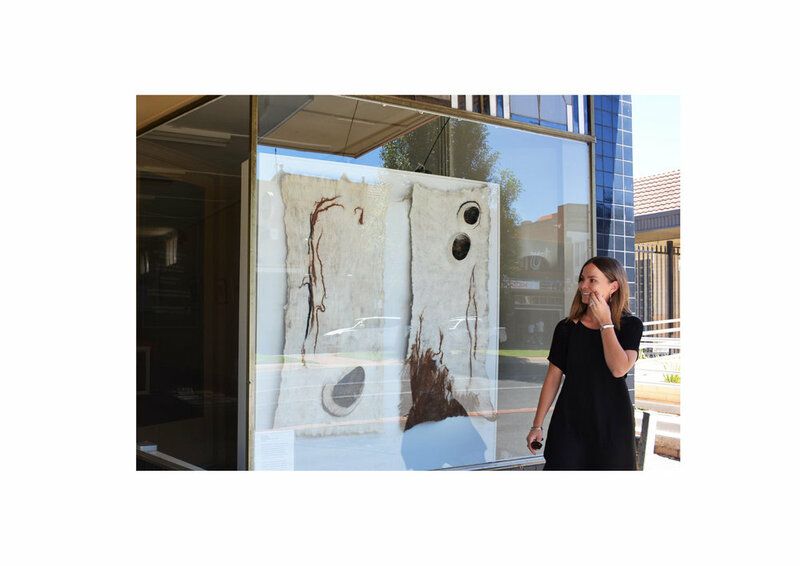 Both of Jess' pieces conceptually explore natural curiosities including the phases of the moon and the Australian landscape. Jessica Forster PHASES II - June 2017 - Merino and Cross Bred Wool, Wet felted using a resist process. "I have always been curious about the cycles of world. The day into night, a seed into plant, an embryo into a human being. Phases II is a sculpted from a singular construction of wool felt, moulded by hand. The inside layers are naturally dark merino wool, while the outer become lighter. We are given insight through portals into the form. Although the outside layer is what dictates the shape, be aware of the play of light, and how it forms its own elliptical crescent shadows. It is a conceptual exploration of material and form that reflects my recent fascination and experience of the properties of the moon. From impacting the elements, influencing the ocean tides, the growing of plants to our own states of mind. Yet it is a constant in our world, a definite." I feel I am a human satellite: a constantly orbiting nomad, circling home. My materials and motifs are intuitively born into felted life, dictated by wandering hands and thoughts. Satellites tells a narrative about an intrinsic connection to land and place. Constructed with a singular formation of wool felt, undulations along the piece form a landscape of pods and connectors. The protruding organic shapes are like cocoons or seeds at various stages of blooming. They are the places I’ve nestled and made my home. The felted rope mimics my regular in a state of transit. As I get older, travel further, explore more; I feel as though my relationship with home and the land deepens. As does my connection to natural materials and fibres – a relationship I’m beginning to nurture.